Order automation through integration is the key to providing same-day shipping and highest possible order accuracy levels. 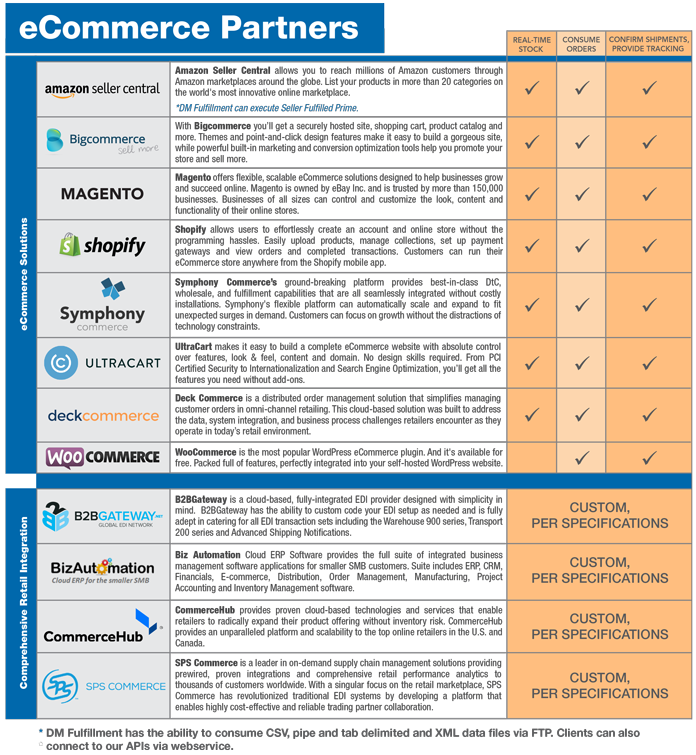 DM Fulfillment offers many options to connect via EDI and web-services either through direct integration or through industry-leading EDI and web providers. 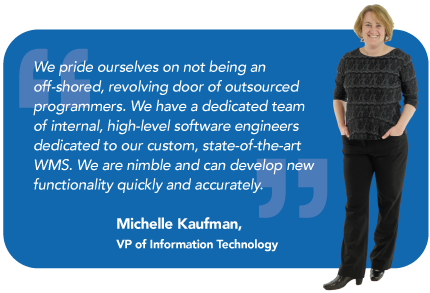 A dedicated IT development staff ensures the integration process is streamlined. Scanned packing slips allowing you access to data any time. Full order management system with automated cross-shipping. Multiple invoicing options with as much or little detail as you want. Custom reports delivered to you automatically. Detailed routing labels to ensure your product gets to the right building and the right person within that building for B2B shipments. Precise tracking—track what units came in on any given shipment. Comprehensive documentation and analysis for continual improvement of your ordering and tracking. DM has multiple options to connect via EDI and web services for order automation. Whether you have a provider you are currently working with or need a recommendation for a new one, we are here to help. You will also enjoy web services for real-time QOH that will feed into your system. Many technologies are used to keep our mutual information secure. Redundant Cisco Firewalls are maintained with current versions of IOS software. In addition, an intrusion prevention system deters unauthorized access. Connections to our Distribution Centers are done through private MPLS connections providing greater security than traditional VPN tunnels. Our fulfillment portal uses SSL technology to secure client log-in and passwords protecting against unauthorized access.